Easy and yummy for breakfast or dessert! This is my version of a bread pudding I found online. You can use any kind of bread, I used 5 slices of wheat and 4 slices of white bread, because I was low. It does not alter the taste in any way. It is still delicious! Side note, This is my first project so bear with me. The picture uploader doesnt seem to be working, so there are no pictures. I sent emails but never got any replies. So as soon as its fixed, Ill get some pictures up if possible. Gather your ingredients and nesicary supplies for baking. Preheat oven to 350 degrees. Take the nine slices of day old bread and tear in to pieces, placing them in the baking dish. If you dont have day old bread, toast them first like I did here. In a mixing bowl, mix the eggs, milk, sugar, cinnamon, vanilla. In a microwave safe bowl melt the butter for about 15-20 seconds. Drizzle the melted butter over the bread in baking dish. Pour the egg mixture over the bread and lightly push down with a fork or spoon so that the bread is covered and soaks up the egg mixture. Bake in oven for 45 min, or untill it springs back when touched. When you take out the bread pudding out of the oven, it will be puffed up. It will deflate, so dont be alarmed if it goes down excessively. Thats it! You can eat it fresh out the oven, or even out the fridge. Goes well with cool whip when cold as a dessert, or with coffee in the morning for breakfast. 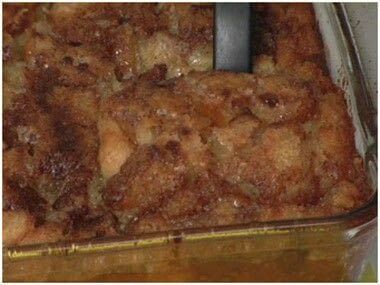 I love bread pudding!! I had a "breakfast" one and it sausage it was grand!!!! !